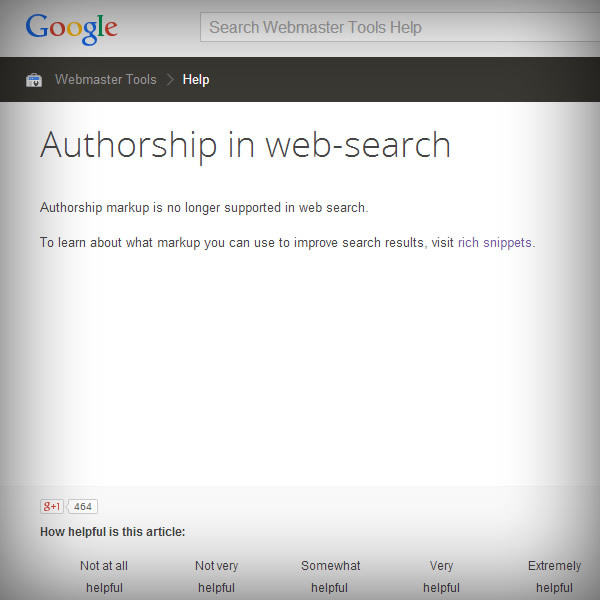 Google Authorship info is no longer showing up in search results. Glory! I remember the first time I added the appropriate rich snippet code for a client on a blog (at the request of their somewhat questionable SEO company, but that’s a story for another day.) because I thought it was one of the most useless things. Yeah, I get the idea that it made the result stand out because it looked different and had a profile pic in it, but other than that it seemed like useless self-promotion. What if you have a employee blogging and they leave your company under less than favorable circumstances… what do you do with that Authorship info then? All together, it felt like a not too great idea, but we all live and learn, right? The bottom line is this: There is no substitute for good relevant content updated on a regular basis with the proper markup. All these other little new tricks and tips that we end up paying people to do are going to come and go, but content is still king.